What is the Major Difference Between Real Estate Broker and Agent? How to Check the Quality of Plywood on Field & Laboratory? Why Should You Test Plywood? Nowadays Building construction has expanded in a big way. It has large numbers of raw materials, i.e. cement, sand, aggregate, brick, wood, steel etc. Every material plays their particular role in the strength and the durability of the building and quality of all materials are of prime importance. In all the materials wood is perhaps the ancient construction material. Perhaps it would not be an exaggeration that the building construction started from the wood itself. In today’s time, it has emerged as important and in an artistic way. The wooden product is regularly used as an important raw material for building construction as well as for furnishing homes and offices, woodworks for boats and ships, partition and external walls, wood flooring system, wall cladding etc. Also Read: Plywood: All You Would Like to Know! In the wooden product plywood is the most common and reliable material. In the market, it is available as sheets of wood, called plywood sheets. Various types of plywood and plywood grades are easily available in the market. It is used in furniture, wall partition, doors, stairs, roofs, kitchen cabinets, etc. and also gives the strength assurance for its use either inside or outside, or in a different exposure like dry, humid or moist environment. Hence, testing of plywood is required before using plywood for the greater life, durability and serviceability of construction. The basic plywood properties are expected stability, high strength, flexibility, fire resistance, etc. If you want to know more about these plywood properties check the previous article named properties of plywood as a building material. It’s essential to check the plywood properties for the achieving desire strength and performance. There is various plywood testing available for the checking of the properties of plywood. There is two kind of tests performed on the plywood known as a field testing of plywood and laboratory testing of plywood. Field test gives a general idea about plywood quality at a first observation on site or in-store and on laboratory test gives a scientific approach to assure of quality. What is the Size & Cost of Plywood? You can check the plywood quality on the site, by performing some basic tests, which are called as a field test, i.e. A thickness of plywood sheets remains same all throughout the sheet. For finding any variation present in thickness, measure the four edges of the ply. The undulation of plywood sheets, gives an ugly finishing to the surface, after polishing, laminating or painting the product. The uneven surface also indicates lower strength and improper production techniques. For finding these, move your hand slowly over the flat surface of the plywood and feel any undulation or unevenness on the surface. 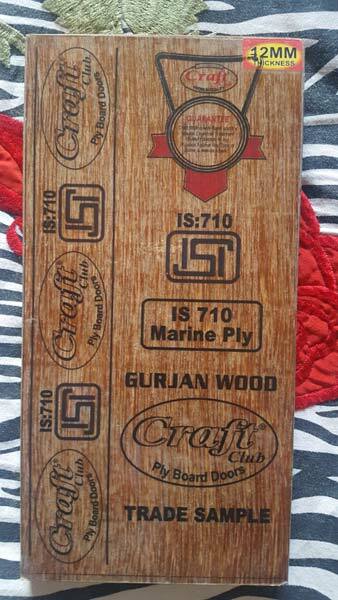 Generally, you notice some sign like ISI-303 or ISI-710 on plywood sheet when you purchase it. Those numbers are Indian standard guidelines number, which is given after the testing of plywood and assure the quality. ISI-303 is for general purpose (commercial and BWR-boiling water resistant) plywood and ISI-710 is for marine plywood. These are the different plywood grades. If you want to know more about plywood grades, check the previous article, Different Grades of Plywood. 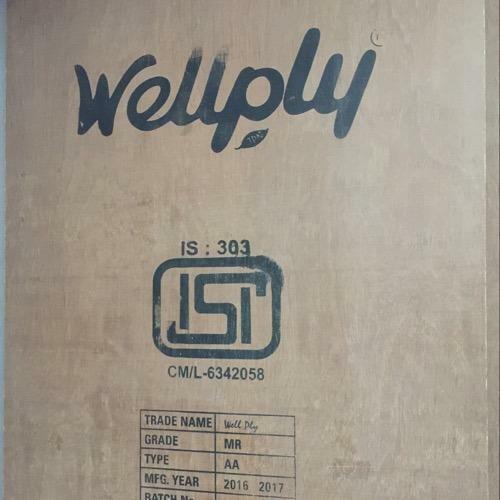 This sign confirms that your plywood sheet has been tested according to that specific standard and it is according to the standard quality. Laboratory testing of plywood with their relevant guidelines are as mentioned below. Also Read: Which Types of Plywoods are Used in Flush Door Shutter? Density directly affects the strength, as an increase in the density increases the strength too. Moisture content also determines the plywood quality. The plywood strength gets adversely affected and it becomes weak when the plywood is very dry (having low moisture content). On the other side, when the plywood is too moist, its likely to decay and rot in the future. As per recommendation, the density of plywood should be around 800 Kg/m3 and moisture content should be not less than 5 percent and not more than 15 percent. This test is conducted when the plywood sheet has been stored in the dry heat condition. From this test, you can evaluate the resistance of plywood to delamination in storage under dry heat conditions. This test is performed to check the plywood quality in the tenacity due to which the bonding material holds the veneers together. The water-resistant test of plywood is required, where the plywood is subjected to alternate drying and wetting condition or high humidity condition. Also Read: Is Waterproof Plywood Myth or Fact? The mycological test is conducted to evaluate the resistance power of the glue line (adhesive) from attack by micro-organisms. It is not a test of the durability of the species from which the plywood is manufactured. This test is most essential for plywood. It’s intended to assess the nail and screw holding capacity of the plywood. This is most important as the life of serviceability of mostly furniture or element will depend on that. Testing of plywood ensures the plywood quality and helps you in a selection of proper material for your use. So that your products have desired strength and long durability and give you self-satisfaction that, you are using the right material and your money invested is an investment and not wastage and you are getting value for the money. Previous PostPrevious Membrane Finish in Modular Kitchen-All You Need to Know! Next PostNext How to Select the Right Pumps for Dewatering on a Construction Site?